There’s a blog post up about the future comic schedule. But right now it’s 8:30pm in London and 7:30pm in Reykjavik! You’ve been taken in by the “Daylight saving” crowd. Remember, daylight saving is a myth, like mermaids, free lunches and Tilda Swinton. I see Tilda Swinton as more of a Ms. There is only one time and that is UTC! The state of the light switch in the big room with the blue ceiling is irrelevant; lightswitch state saving time doubly so! Um… Hooray for opinionated people! As far as I know, the UK, Australia and Japan drive on the left, everyone else does it wrong. It must be an island thing. South Africa drive on the left too. Not quite an island. I’ve always been confused as to why the French are directly South of us but still manage to get the time wrong. As a portuguese, I agree! 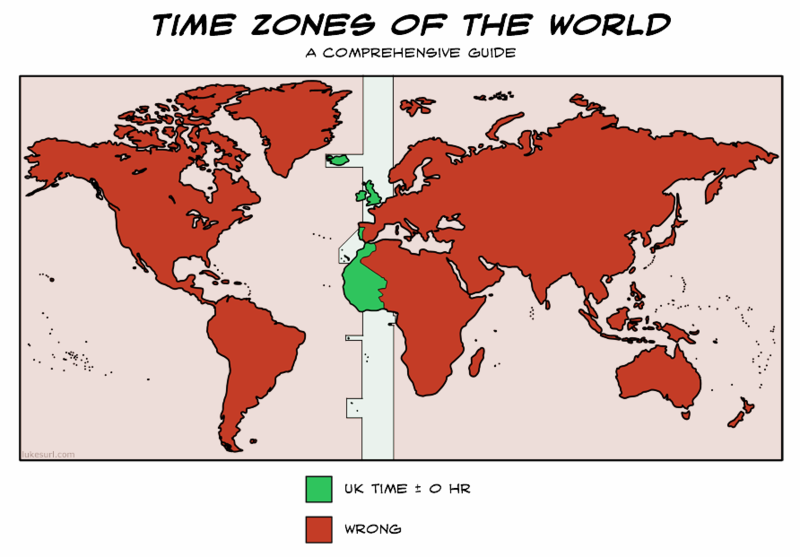 Not everybody in the same time zone as the UK is on UK time, because in Northern summer, UK time treacherously departs from r e a l (GMT) time and jumps Eastward, while equatorial Africa does not. Just now, UK time matches Nigeria and not Ghana. I would like someone to explain how China can have one timezone but any country smaller than it can have multiple timezones.